Maine is quite far from the Mexican border, but there is no shortage of delicious tacos, especially ones with a special Maine twist. From food trucks to Mexican restaurants, many places in Maine serve up some darn good tacos. Established in 2013, El Corazon has become Portland’s most popular food truck. Serving up authentic Mexican food, Chef Joseph Urtuzuastegui knows how to create delicious tacos using local Maine ingredients. And you can’t be the beat! Tucked away in quiet Brunswick, this fun, “recycled Mexican low-rider chic cantina” opened in June 2004 and has since become a college student and local favorite. Using only locally grown, sustainably raised produce, meats, and seafood, you’ll love the tacos at El Camino Cantina. We especially love the cornmeal fried fresh Maine haddock. Yum! Known mostly for its epic burritos, Bruce’s Burritos also makes tasty tacos. Choose from a single taco up to three tacos and you’ll have a filling meal for under $10. Filling choices include chipotle chicken, chilorio pork, chorizo sausage and more. Las Palapas Mexican Restaurant is Bangor’s best Mexican Restaurant. With an authentic décor and large selection of premium Mexican beers and margaritas, you’ll find great food at Las Palapas. Even the Bangor Daily News rated the food at Las Palapas some of the best in the area. We recommend the taco salad fajita. Every year, hundreds of migrant workers come to Maine during the summer to harvest blueberries at Wyman’s in coastal Maine. Last year, the Vasquez family opened a seasonal takeout stand selling authentic tacos using handmade tortillas made fresh daily. Check their Facebook page to find out when you can get your next tortilla fix. Most of the best Mexican food can be found in tiny coastal towns in Maine. Operating out of a converted barn behind the owner’s house, this little restaurant packs some serious spice. Blending traditional Mexican street food with good old Downeast Maine produce, El El Frijoles is a taco stand you don’t want to miss. Try the spicy lobster for the perfect mix of Maine and Mexico. The Home Kitchen Café is not a Mexican restaurant, but it does serve some of the best tacos in New England. The Boston Globe featured their lobster tacos as one of the best in the area. With the perfect mix of lobster, house-made corn tortillas, salsa, avocado, and special taco sauce, you can’t not try these Maine tacos. With two locations in Scarborough and Portland, El Rayo Taqueria is a longtime Portland favorite. With an extensive taco menu from pescado to al carbon to fried shrimp, you’ll easy find your personal favorite on the menu. If one isn’t enough, you can always mix and match on their taco plate. 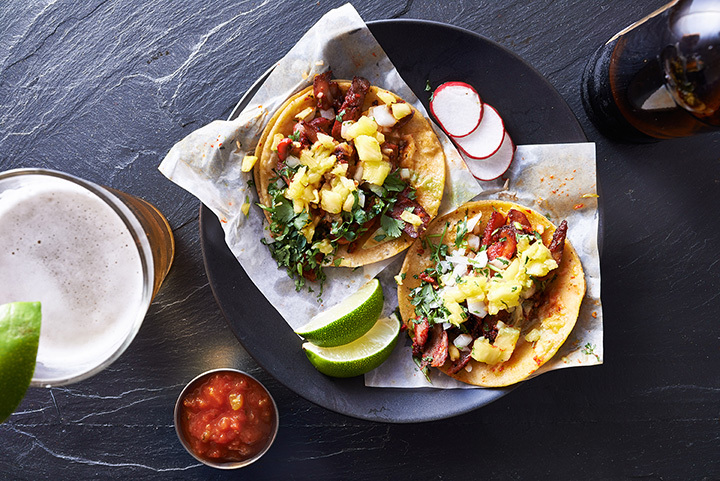 Don’t forget to pair your tacos with a Mexican beer on tap. Once a popular taco cart downtown, Hella Good Tacos now has a physical home at Steve & Renee’s Diner. With down-to-earth service, incredible flavors, and a good value, Hella Good Tacos is one of the best places to get tacos in Portland. You can’t beat a taco for $4! Opened in 2004, Loco Coco’s Tacos serves up authentic Mexican food on Maine’s southern seacoast. Using his family’s recipes, Luis Valdez serves up tasty Mexican food in his full-service Cantina and dining room. Choose from tradition style to Barbacoa to even Lengua and Bahn Mi Tacos. Everything is authentic here.